PU-515PL-KIT gör det möjligt att skicka okomprimerade HDMI signaler över en enkel Cat5e/6/7 kabel. Denna prylen har utökad funktionalitet av RS-232, 2 vägs IR kontroll och "Power over Ethernet" (PoE) över samma kabel upp till 60 meter. 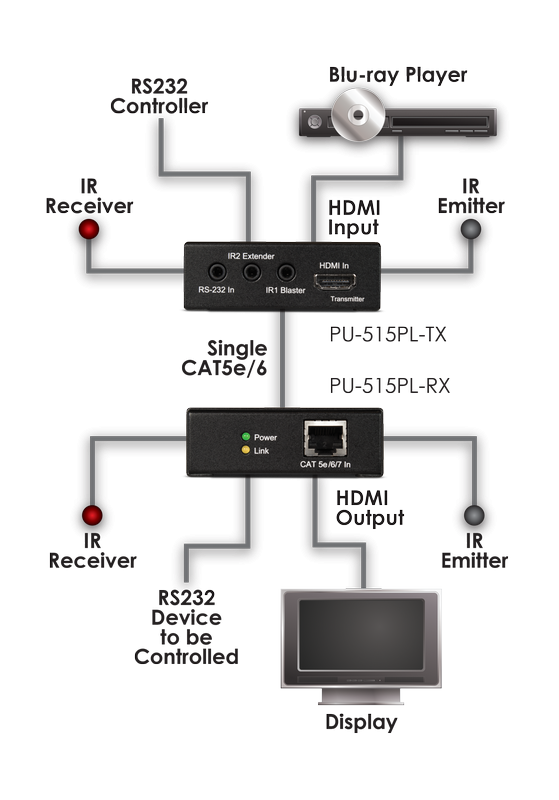 The PU-515PL-KIT allows uncompressed HDMI signals to be transmitted over a Single CAT5e/6/7 cable. This solution has the added features of RS-232, 2-way IR control, and Power over Ethernet (PoE) functionality over the same CAT5e/6/7 cable. These combined HDMI and control signals can be transmitted up to lengths of 60 metres.